Looking for a perfect place where you can enjoy, relax and spend with your family, friends and even special someone? 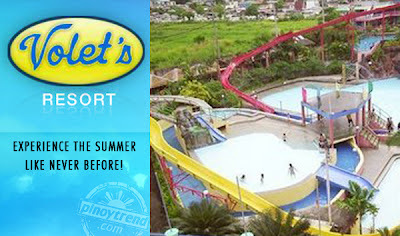 Check this one place in Cavite where you can experience the summer rush like never before - Volet's Resort. With Volet's Resort landscaped gardens and expansive wave pool, this is a resort that stands unparallel in beauty and service in the entire country, that's why Pinoy Trend features Volet's Resort as one of the Summer Getaway Resort in the Philippines. 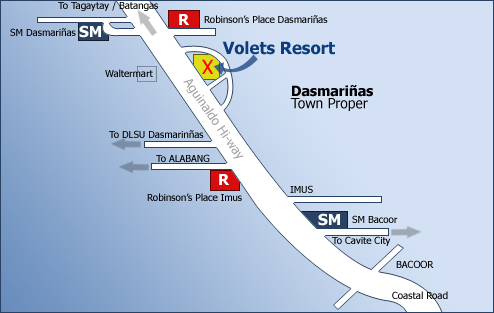 Volet’s Resort is located along Aguinaldo Hi-Way, Dasmariñas, Cavite (near Waltermart, Dasmarinas). They also offers other amenities such as Eduardo's KTV and Live Band, Ejj's Kitchenette, and the Evolution Gaming. All rooms at Volets Resort are airconditioned with hotel and cold showers for you to be more comfortable and relaxed. Spend out your summer fun at Volet’s Resort! For Hotel and Room Rates inquiries and resevations, kindly contact Volet's resort contact details provided below. How to get to Volets Resort? If you from Manila area, simply go to Lawton Park and Ride then ride a bus bound to Tagaytay and just drop off in Volets Resort along Dasmarinas Cavite. **images and details from this site credit to respective owners and Volet's Resort website. The main objective of this site is to feature Volet's Resort for the one of the Summer Getaway Resort Philippines with their rates, reviews, latest updates, cottages, reservations, exciting pools, contacts details and location map. mag kanu po ung room? hi! kelangan pa po ba ng reservation? at wala po bng cellphone number? Thanks for this post. We will go to the resort this April. Would you suggest going there on weekends? I am thinking if there are a lot of people during the weekends or should we settle for weekdays? can we have room rates and cottage rates? Thanks ! magkano po room rates neo? reply po thanks..
Do we need to reserve in advance or are walk-ins ok? can i ask 4 cottage and room rates? Tnx in advance! how much po ang room rates? magnko po aabutin kung 7adults & 3kids po? (entrance & room rate) my blihan po b ng food sa loob ng resort? allowed po ba magdala ng foods? How much now is the overnyt entrance fee for adult & children?